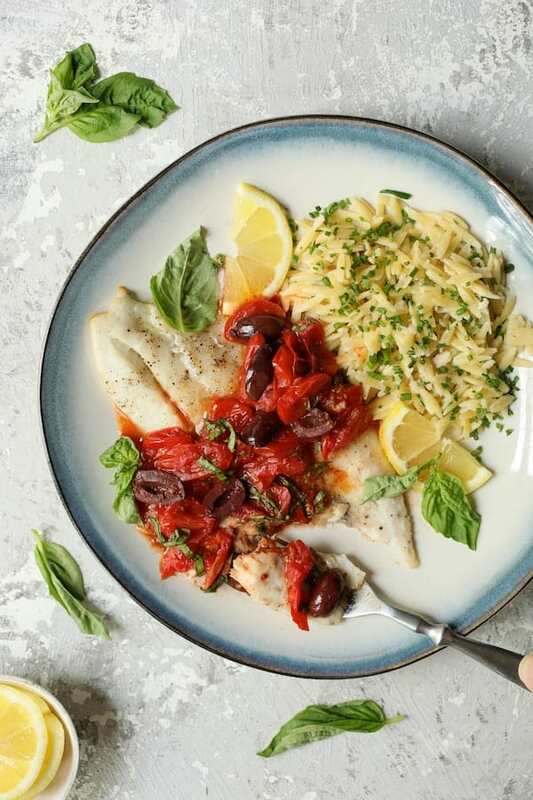 Baked Fish with Cherry Tomato-Olive Sauce and Lemon Chive Asiago Orzo makes an easy springtime dinner for two that rocks with flavor! Hey, y’all! Here’s a great Mediterranean-inspired fish dish that hits every note! 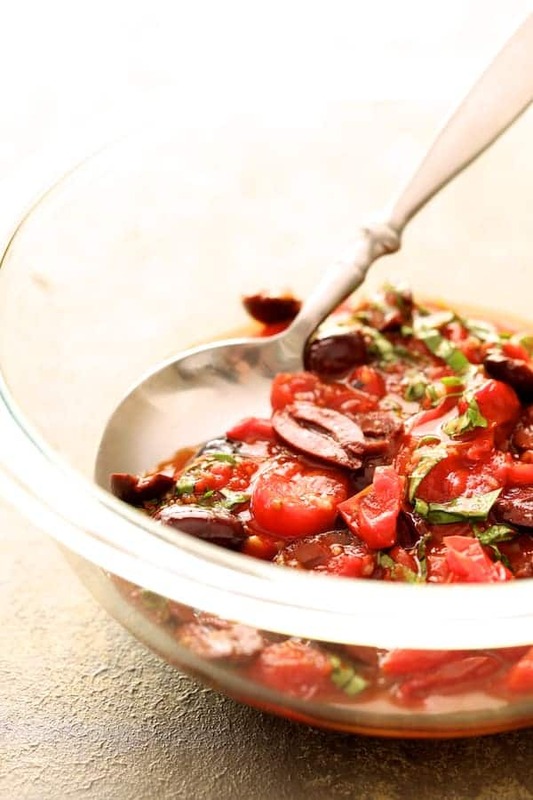 It’s healthful, easy, flavorful and versatile! Best of all, you may be able to pull it together with what you already have on hand! One thing we always have on hand are either cherry tomatoes or grape tomatoes. When tomatoes are not in season, their flavor is superior to conventional hothouse supermarket tomatoes. Best of all, when roasted, they make a delicious sauce for pasta, fish or chicken with minimal knife work. When the cherry tomatoes are nice and soft, transfer the tomatoes and all their juices to a bowl. Place the fish fillets on the same baking sheet and let it bake away while making the rest of the sauce. Add the black olives, garlic, a touch of white wine, a pinch of crushed red pepper flakes for some heat and thinly sliced fresh basil. How easy is that? 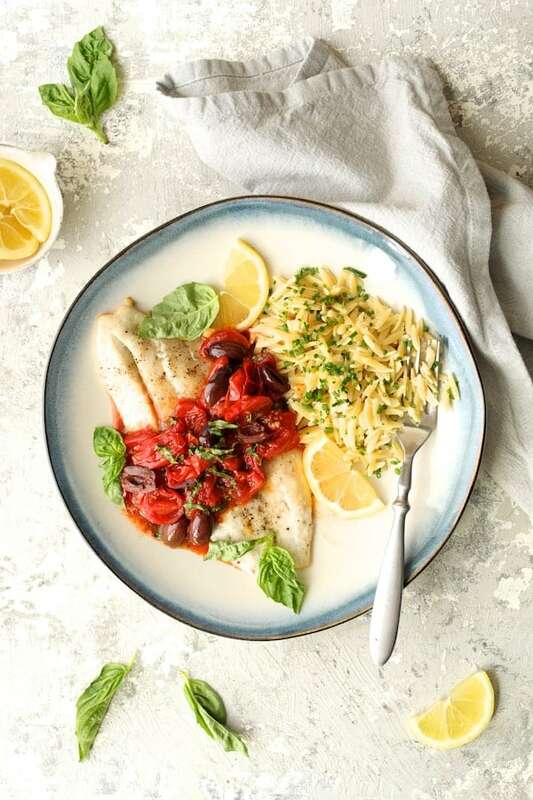 The Lemon Chive Asiago Orzo makes the perfect side dish to the Baked Fish with Cherry Tomato – Olive Sauce and can be cooked while doing the fish and sauce. 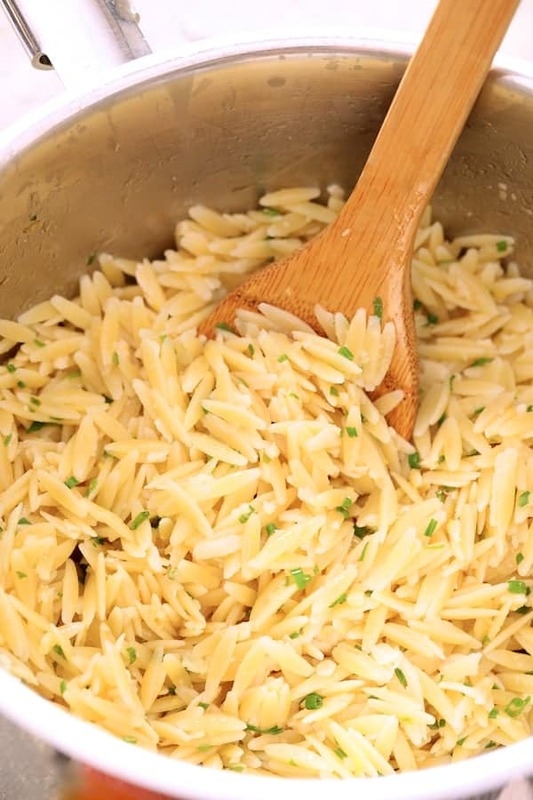 Orzo is a rice-shaped pasta and cooks in minutes so it’s ideal for a quick and easy side dish. 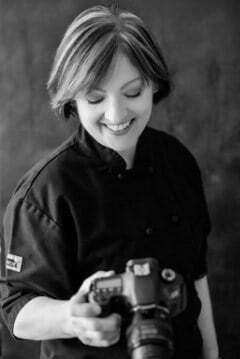 I used barramundi here but you can use any fish for this recipe. Thin, flat filets such as tilapia, sole, flounder or trout will cook faster. If you have more time, a thicker fish such as cod, halibut or sea bass will also work. I did a post a long time ago for Australis Barramundi and really liked it so now I always keep it on hand for a fish dinner any night of the week. If using the barramundi for this baked fish dish, you’ll need to thaw it first. I discovered this thawing plate a while back and it has become an indispensable tool in my kitchen! A cast iron skillet turned upside down will also work, but be sure to lay some plastic over it first as the moisture will cause it to rust. That’s it! Easy, peasy, light and healthful! Here’s the barramundi post along with some of my other top fish posts! FISH AND SAUCE: Preheat oven to 375 degrees. 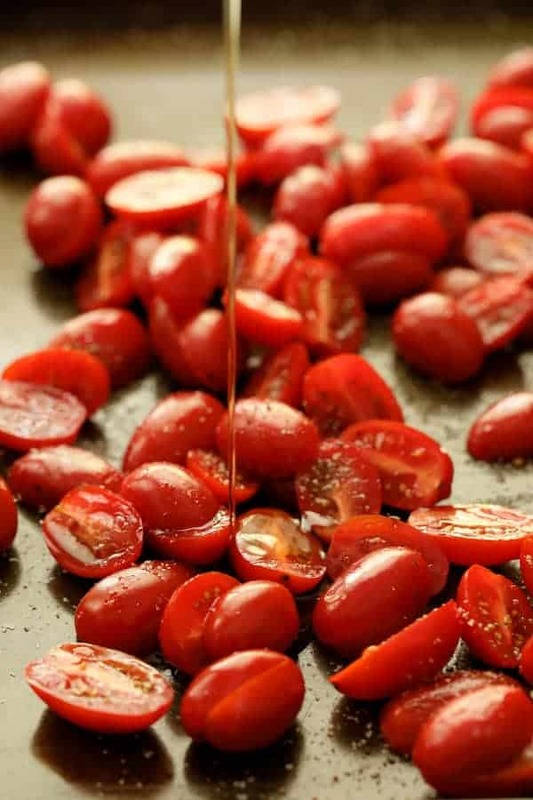 Place tomatoes on a nonstick baking sheet, drizzle with 2 tablespoons olive oil and season with salt and black pepper. Roast for 10 minutes. Transfer to a bowl along with all the juices. Place the fish on the baking sheet, drizzle with remaining 1 tablespoon olive oil and season with salt and black pepper. Bake for 10 to 12 minutes or until cooked through and easily flakes with a fork. Meanwhile, add olives to tomatoes along with garlic, wine and red pepper flakes. Just before serving, add the fresh basil. Serve with orzo and lemon wedges. ORZO: Bring a small saucepan of salted water to a boil. Add the orzo and cook to the al dente stage. Drain in a sieve or colander then return to the saucepan. Add the butter, garlic, lemon zest and juice and cheese. Stir until butter is melted them add chives. Serve immediately.